This elegant style, solid wood, 66inch double sink vanity measures 36 Inches in Height x 66 Inches Wide x 22 Inches in Depth and Weights 300 Pounds. Unique marble top double sink chest with complete fixtures. 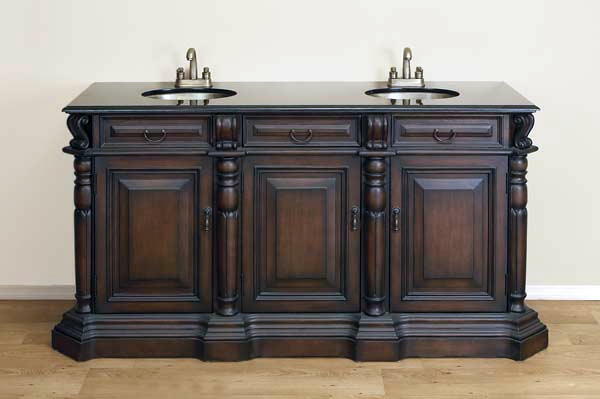 Beautifully hand carved in solid wood, this lovely double sink vanity is of hand-made, highest quality workmanship. It comes with best Italian heavy marble top with luminous black gradations and with a moisture resistant finish. The countertop is predrilled with 8 inch spread holes for the faucets. Includes Undermount sinks and classic style faucets. Imported furniture. Countertop, copper sinks and copper faucets are included! Motor Freight shipping is $265 extra. Huge selection of Sink Cabinets.